← Waves’ Top Drum Plugins on Sale Today ! Audiomodern has just released the 1.0.3 Version of their very first VST/AU plug-in, Riffer! Available now from the DontCrack Store at the introductory price of $39 until October 22nd, 2018. 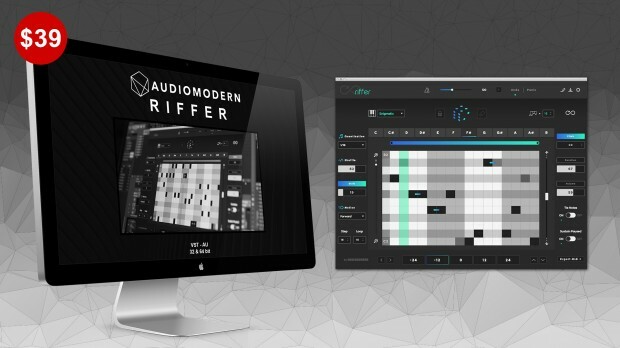 Get Audiomodern’s Riffer at the introductory price of ONLY $39!! Introducing ‘Riffer’, a smart MIDI tool that generates random Riffs for your Sounds, Software & Hardware. Built both for studio and live performance. Designed to feed anything that accepts MIDI signal, Software & Hardware, you can choose from 50+ scales, choose pattern complexity, steps, start and end points, set pitch, transpose, motion, measures, and much more to serve as inspiration for your musical masterpieces. To get your Version 1.0.3 go to your Audiomodern account and log-in. When the download is complete, uninstall the current version from your computer and re-install the new version. This entry was posted in DontCrack, Plug-ins, Promotions and tagged Application, Audiomodern, Composing, Melody, MIDI, Music Creation, Plugin, Riff, Riffer, Riffer 1.0.3, Scales, Scoring, Sequences. Bookmark the permalink.